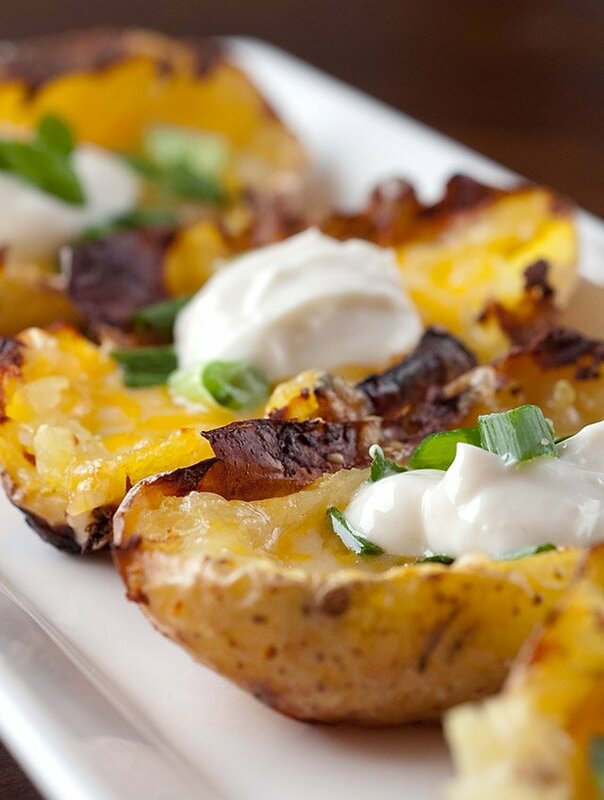 Cheesy yukon gold potato skins topped with a dollop of spicy sour cream. Makes a great appetizer or side dish. Dovetailing tip: Use the leftover Crisp Garlic Yukon Gold Potatoes from Meal 2. A great time saver because your potatoes are already cooked. Scoop out the potato and continue with the directions. Brush potatoes with olive oil and sprinkle with kosher salt and bake for 45 minutes - 1 hour or until a fork can be inserted to the potatoes easily. Once potatoes are cool enough to touch, cut in half and carefully remove the flesh. Try not to break the skins. I'd recommend saving the flesh for baked potato soup. Increase the oven temperature to 450 degrees. Spray a cooling rack with cooking spray. Place the potato skins, skin side up on the cooling rack. Bake for an additional 15 minutes or until skins are crispy. Remove potato skins from oven. Divide shredded cheese evenly between the potato skins. Sprinkle with green onions. Bake for 5 more minutes or until the cheese is melted. You can also place them under the broiler for 2 - 3 minutes to get the cheese hot and bubbly. In a bowl mix the sour cream, horseradish, if using, and Worcestershire sauce. Place a dollop on top of each potato skin. Serve immediately.